A tiny image of an cardinal decorates this Christmas memorial ornament, shaped in a cross and perfect for your holiday tree. 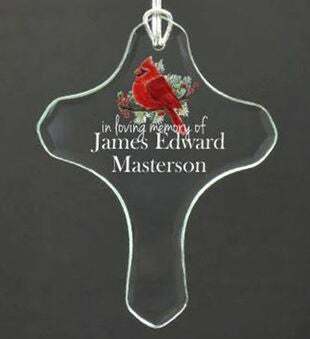 A loving and simple way to honor deceased family or friends, this personalized Christmas ornament can also be displayed year-round on a shelf or anywhere else in your home or office. Featuring the name of your loved one, the cross includes a ribbon for hanging and is packed in a velvet pouch to avoid scratches or breakage. So pretty!